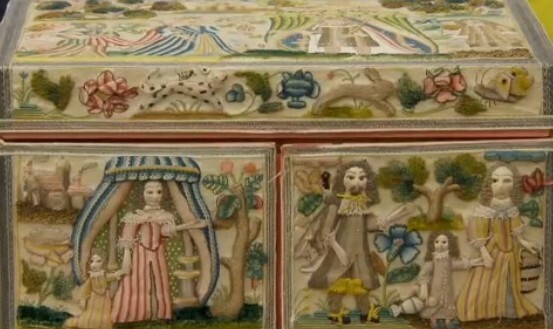 Stumpwork became popular in the 17th century, with it peaking between 1650 and 1690, although the term stumpwork was only used from the end of the 19th century. Before that time however, it was known as raised work or embossed work, which dates back to the 15th century. The work was highly padded and involved intricate designs, inspired by Europe’s ecclesiastical embroidery. Sadly, interest in this wonderful technique diminished when new ideas and inspiration from the orient swept across England at the start of the 18th century. Through the course of the 17th century, hand embroidery was seen as part of a wealthy child’s education, with stumpwork being the ultimate, final piece. Girls would first practice their skills with canvas, beading and whitework techniques alongside band samplers, refining their skills before starting work on the stumpwork casket. This was a chance for them to pull together everything they had learnt so far and refine their skills. It would take them many years to complete these projects and if you ever have the privilege of seeing a piece up close you will certainly be able to appreciate why it takes so long. Below is a piece from the V&A’s collection, worked by Martha Edlin. Designs were drawn up by professionals in the form of kits. 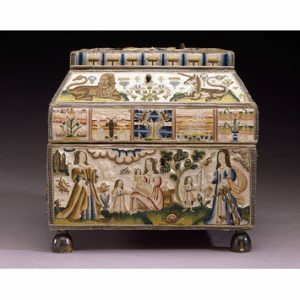 The most famous projects are the stumpwork caskets and there are some wonderful examples in the V&A. However there is also evidence of it being used on tray’s, book covers, gloves and mirror frames. The professionals would also provide the young girls with carved hands and fruit to add to the kit. 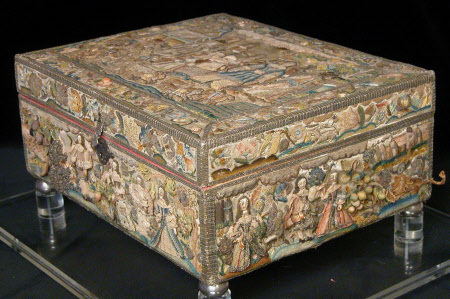 Once the embroidery was completed it would have been made up into the casket/mirror frame by a professional. The caskets would be used to hold trinkets, jewellery, needlework tools, cosmetics and small personal items. Many of the same motifs used in the Elizabethan and early Stuart periods can be identified on stumpwork pieces. The kits were predominately designed with pictorial images from biblical stories and classical mythology. Figures would often represent the kings and queens to show loyalty to the crown. Their clothes would have been worked as needlelace slips which were then applied to a padded body shape. The women would have been portrayed in fashionable outfits to make the kits even more appealing to young girls. Floral depictions alongside animals such as stags and lions, insects such as snails and caterpillars and exotic birds like peacocks were then placed in the background to fill the spaces. These were typically out of scale. Canvas slips, textural French knots and a wide variety of surface stitching were also used, all worked on either a satin or linen fabric. Many of the popular Elizabethan plants were worked in detached buttonhole. 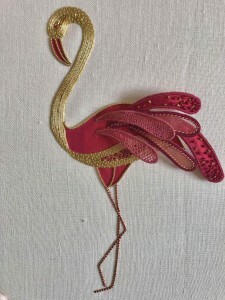 Today, it takes on a more modern approach and includes a wide variety of additional techniques within the designs, including goldwork and tambour beading. If you want to have a go then I have designed a metal thread and stumpwork flower brooch and also this fabulous stumpwork flamingo with additional goldwork detailing. The stitches used today are wide and varied. A few of my favourite are; wired buttonhole shapes (which I shall be putting up a tutorial for shortly), raised leaf stitch, treble Brussels stitch and woven picots. 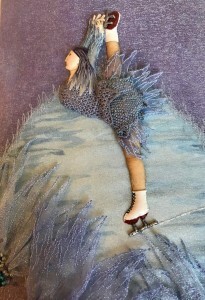 Below is my first proper attempt at stumpwork, a traditional figure skater, that I worked many years ago on the RSN apprenticeship. The clothes have been made as needlelace cordonnets and the underskirt was made from machined organza. The boots were made from kid leather and stab stitched on. This is a wonderful technique to learn and if you would like to have a go then there are some great books you can check out, such as Helen Richman’s Stumpwork embroidery Jane Nicholas Stumpwork dragonflies and the Rsn Stumpwork book by Kate Sinton.